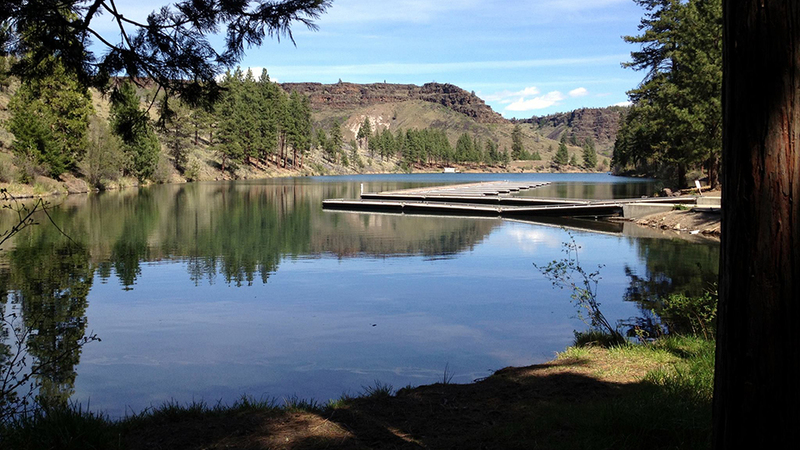 Located about 34 miles northwest of Sisters, Perry South Campground is settled on the shore of the Metolius Arm of Lake Billy Chinook. With its easy access to one of the area’s largest and most popular lakes, this campground is very busy, and visitors are urged to get early on Friday or before if planning a weekend stay. In fact, during Memorial Weekend, after July 4th, and on any extremely hot weekend, seasoned campers arrive as early as Wednesday to stake their site. Motorized boats are allowed on Lake Billy Chinook, making it a fun way to cool off with water sports or a day of fishing for largemouth and smallmouth bass, rainbow, brown and bull trout, kokanee salmon, whitefish, and even the occasional suckers, minnows and dace. Perry South Campground has a day use area and boat launch area, as well as a fish cleaning station for the lucky ones who need a place to prep their catch of the day. The campground features 64 camping sites, and while most are first come, first served some can be reserved. The per night, per site fee is $18 for the first vehicle and $8 for each additional vehicle. On Memorial Day Week, fees increase to $20/single sites and $10/each additional vehicle.